Mountains. Sharp knives. Strange people. Cake. Briefly. Transport from the safe and sane. I still grasp this final symmetry. I cannot imagine that when my parents kicked me out and sent me off to college that the thought ever crossed their mind that one of my teachers would try and turn me into Cheese Whiz. Yet my Foundations class teacher is trying to do just that … and not only to me, but to all my classmates as well. If you are concerned, I should perhaps give the following disclaimer. My Culinary Arts 102 teacher does not approve of processed cheese and she appears to be trying to turn us into cheese whizzes, not Cheese Whiz. If you are not concerned, as I strongly suspect you were not (why do people refuse to take me seriously these days? ), I hope you were at least slightly amused by my punning. Next Foundations class test is on Friday the 19th and covers chapters 7, 9 and 10 of On Cooking. Flavors and Flavorings, Mise en Place, and Cooking Methods. The test after that, however, is on chapters 8 and 21. Chapter 8 discusses dairy products, while chapter 21 is titled ‘Eggs and Breakfast’. An amusing result of product association is that on the double page, full color, picture and title page to chapter eight includes eight whole eggs and one that has been cracked open. This is funny, once you realize that eggs are nowhere mentioned in the chapter. It becomes even more humorous, when you turn to chapter 21 and see three lonely whole eggs and one scrambled egg on the title page. If the chapter on Dairy Products does not mention eggs, what does it mention? Well, the first two pages are on milk with an additional half page on cream. Half a page on cultured products such as yogurt, a page on butter and margarine and then twelve pages on cheeses. Types of cheese, colors of cheese, hardness of cheese, recipes for making cheese, recipes for using cheese. What wines should you serve with cheese? The answers are here. How should you store cheese? Cut cheese? Serve cheese? I thought I knew a decent amount about types of cheese, after reading the chapter on my own. Then I thought I knew a good deal about types of cheese, after reading through the cheese section of the chapter in class and discussing it as a group. We watched a video for cheese-vendors and I knew even more about cheese afterward. I learned which cheeses various countries were famous for. I learned a new classification to add to the five I had discovered in my textbook. Very well. I had been educated on cheese. So, I went into class this morning and we took a non-graded quiz on chapter 10, which you may recall is written on ‘Cooking Methods’. The quiz took up about 45 minutes and the remainder of the video, which the teacher had planned on us watching, turned out to be nonexistent. Then, the teacher pulled out her book on cheese and started reading aloud and chalking strange words up on the two blackboards. Things like Taleggio, Brick, and Cambozola appeared, stayed, and were erased to make room for Chabchou, Mizithra, and Explorateur. I now have my notes to study in addition to the textbook pages. In all, 22 pages on cheeses. Since all the food related reading and baking I have to do at school stirs my creative juices, I did some extracurricular activity yesterday afternoon. Tuesday night, I took most of the boxes of peaches from the kitchen floor, where it was dispersing a lovely aroma throughout the house. After rinsing the fuzz off, I cut them into eighths and peeled the slices. The skins were eager to separate from the flesh and the peaches were tender and juicy. I sampled a few slice, to be certain they were of good quality, then placed them in a bowl with some lemon juice and refrigerated them overnight. 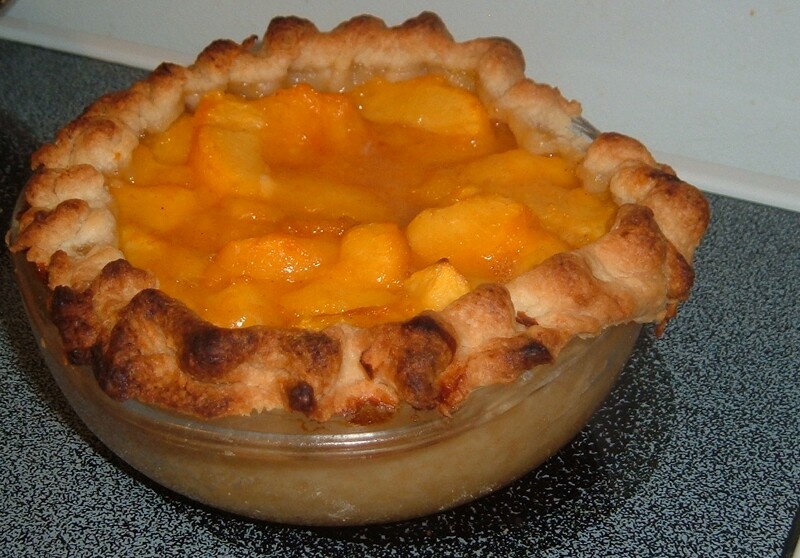 Wednesday afternoon, I got out the peach pie recipe … and discovered that it called for tapioca or potato starch. Knowing that these ingredients were not present in the apartment, I tried looking through a few other cookbooks, but couldn’t find a recipe to suit myself. I decided to put the pie off indefinately. However, when I opened the fridge to look for dinner, the pre-sliced container of peaches revealed itself to me. I was unwilling to leave them in the fridge in that state, so I reevaluated and decided to try to substitute cornstartch, despite my cookbook’s dire warning about it spoiling the flavor of the pie. Piecrusts ought to be easy enough to make, but they seem to take on a new level of difficulty, when you are living in fear of overworking the dough. Bakery lab can make you feel like that, yes. I did successfully deposit two rounds of dough in the freezer, to firm up before rolling. I don’t think they were overworked at that point. While they chilled, I washed dishes … again. I must be preparing for life in my own house, because it has started to seem like I wash dishes all day. First at school, where the first two weeks I was a baker, responsible not only for my own dishes, but any unclaimed, unwashed dishes as well. Also, I was not supposed to leave school until all the dishes in the bakery were clean, meaning that helping out with other people’s dishes was fairly necessary. Then, at home, where we don’t have time to wash breakfast or dinner dishes much of the time. Thus, they pile up in the sink, making the kitchen non-functional. This week, and next week, as a boulanger (bread baker) the dish load seems like it will be lighter. But don’t tell my roommate, she might ask me to do more at home. Once the kitchen was cleaned, the dough had been in the freezer for nearly an hour. I removed it, found the rolling pin and began to work it into a circle. After the first few motions of the rolling pin, I paused. I checked the cupboard, I looked through my baking supplies box, I checked under the stove and on the counter, I asked my roommate. There was no pie plate in the house. Having got this far, however, I did not intend to be stopped by such an insignificant problem. I pulled my six tartlet pans out of my baking supplies box and borrowed a small glass casserole dish from the kitchen counter. Rolling the pie dough didn’t work out very well, but it never seems to to me. As I told my sister/roommate ‘if the pie dough is easy to work with, you’ve done something wrong’. The first try, I was working so hard to not dry out the dough that it stuck to the counter and tore in ten places. I gathered it all back together, floured the counter, and began again. The shape was not circular, but that was alright, as the casserole was not circular either. I laid the dough in the dish, crimped and trimmed the edges and began with the second round. One would think I could learn from my mistakes, but apparently, I hadn’t been paying enough attention, for the same procedure of tearing, regathering, and rerolling took place with the second half of the dough. This I pressed into the tart pans, then rolled the rolling pin over their edges to cut the dough to the right shape. Leftover dough scraps, I rolled out, cut into kangaroo and sausage dog shapes with my cookie cutters and set aside to be baked later, with cinnamon and sugar sprinkled over the whole. Next, I began on the tarts. 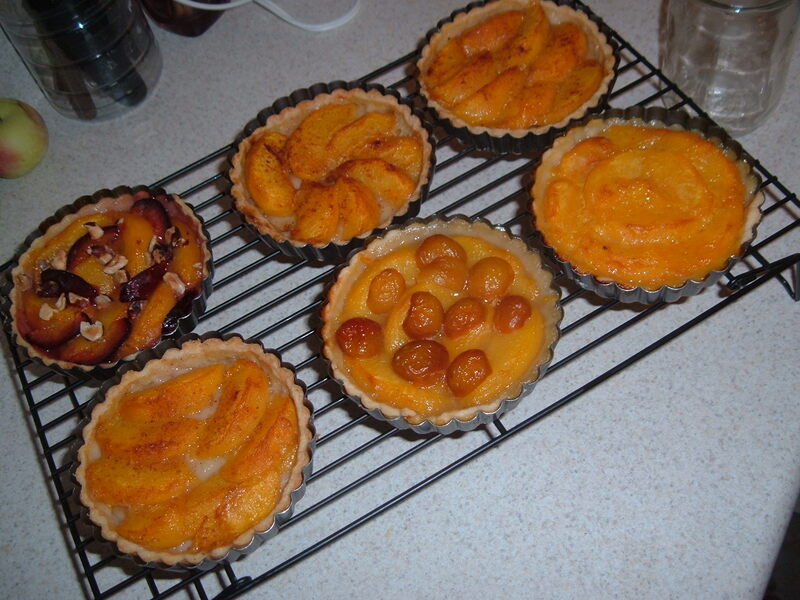 Each tart was filled with peach slices, laid out in various patterns. Then, for the remaining peaches, I dumped in about as much sugar as I deemed necessary, added some cinnamon and nutmeg and stirred it all together. As I mixed in the sugar, I sprinkled some over each tart. The cinnamon and nutmeg, I only brushed over three of the tarts, wishing to do further flavor experimentation on the others. I avoided adding any additional lemon juice, as I was already worried that what I had put in the day before was excessive. Once it was mixed, I poured some of the liquid into a small bowl, mixed it into a paste with cornstarch and returned it to the mixing bowl. As I did not measure any of the ingredients, I don’t suppose I actually needed a recipe after all, but I found it useful for knowing which ingredients I wanted to use, even if not for amounts of ingredients. Once this was poured into the casserole crust, I placed it in the oven and moved on to my remaining tarts. For the first, I placed frozen Ranier cherry halves over the peaches. I would have used almond extract, but found none available, so I sprinkled on a drop or two of lemon extract and set that tart aside. On the next, I laid some fresh plum slices over the peaches. To this tart, I added a bit of additional sugar, to counter the tartness of the plums. While rummaging in the freezer, I also came across some chopped hazelnuts, which I added to the plum tartlet. The last tart, I sprinkled with frozen orange juice concentrate. This done, I place them in the oven and waited. They all came out of the oven cute and properly done, no burnt spots. Some of the tarts appeared a bit dry, but there was no crust shrinkage, either on them, or on the larger dish. The larger dish seemed to be somewhat soupy, but as I had merely made a rough guess as to how much thickener would be proper, I wasn’t overly surprised. Pleased with my work, I set them out to cool and left them. This morning, I sampled the orange/peach tart and found it quite yummy, with the crust better done than I expected and not as dry as I had feared, from its appearance. The orange flavor was a bit too strong, but not overpowering as flavors go, it just squashed the peach flavors too much. None of the other tartlets or the large pie have yet been sampled, but I will keep you up to date on how they turn out. For Friday’s test, I have begun making flash cards. How many French cooking terms do you know? Boulanger – owned the first restaurant, the first dish served was sheep’s feet in white sauce. It was supposed to be a restorative. Chefs de partie – line chefs. insignificant underlings who do all the work and get none of the credit. Sous-chef – second in command, the sous-chef is often the aboyeur as well, the expediter. Bartolmeo Platina- author of the first printed cookbook. Gaston Lenotre – master pastry chef, Lenotre is considered the father of modern French pastry. He also began the first recorded culinary school. fusion cuisine – the combination of foods, flavors, and techniques from multiple ethnicities and regional cultures. Careme – master of grande or haute cuisine, he favored the elaborate and claimed cooking was a form of architecture. He made one of the first systems for classifying sauces. Escoffier – father of cusine classique, Escoffier simplified Careme’s system of sauces into five main groups. He is credited with the creation of the kitchen brigade. grand cuisine – the type of food served at the French court, before the revolution. Typified by its elaborate multiple courses. Also known as haute cuisine. Alexis Soyer – one of the first chef’s known for his charitable efforts, Soyer was credited with many kitchen innovations, including ovens with adjustable temperatures and portable stoves. Ferdinand Point – opened a restaurant called L’pyramid, in France. Point was a master of grande cuisine, but is considered the father of nouvelle cuisine. He was one of the first chefs to leave the kitchen to converse with customers at their tables. Well, I seem to have done fairly well with those cards. Now I shall attempt to describe the kitchen brigade. The head of the kitchen brigade is the Chef de Cuisine, or merely Chef. Directly under the chef is the Sous-chef. Under the Sous-chef there are the chefs de partie. At times the patissier is directly under the chef, at other times, he reports to the sous-chef. Line chefs include the saucier, in charge of soups and sauces, the entremetier, in charge of vegetables, the rotisseur, in charge of roasting and often frying and grilling as well. The poissonier is in charge of fish. Wonder why he’s called the poissonier… The garde-manger controls the pantry, the tournant floats to any station he is needed at. The commis is the apprentice. The patissier is the favorite chef of anyone with a sweet tooth. Also known as the pastry chef, the pastissier can be in charge of all baked goods, or can be head of another department, in which the line chefs are the boulanger: the baker, the gacier: ice cream and custard man, the confiseur: candy and petit fours and the decorateur: showpieces and special cakes. The dining room brigade is another story. In charge here is the maitre d’hotel. Working underneath him, but in his own little world is the chef de vin: the wine chef or sommelier. The chef de salle is like a host or hostess, in charge of the entire room in smaller operations or, in large restaurants, part of the room. The chef d’etage is also known as a captain. He must explain the menu to customers and take their orders. If any food is prepared tableside, the chef d’etage does this. The chef de rang is the tablesetter, in charge of food delivery and takes care of any guest needs. The demi-chef de rang is the busboy. They’re one group that must prefer the French name. I know I would rather say ‘I work as a demi-chef de rang’, than, ‘I clear tables and wash dishes’. We have reached the most important piece of a chef’s equipment. The knife. There are ten main parts. 8. The tang – the metal that runs the length of the knife, including to the end of the handle. 10. Just a second, I’ll remember. The bolster – after the cutting edge of the knife runs out and the metal curves up to the handle, there is a thicker block of metal. It is not sharp and it supports the knife. Thus, it is the bolster. Now, there are many interesting and fun things you can do with knives. Most of them have French names. First, the julienne. A julienne is a stick 1/8″ x 1/8″ x 2″. A batonne, the next size up is a stick 1/4″ x 1/4″ x 2″. This is also referred to as the ‘french fry cut’. Brunoise are cubes 1/8″ x 1/8″ by 1/8″. If you want a fine Brunoise, make them 1/16″ x 1/16″ x 1/16″. The dice aren’t French and they are basic. Small dice are 1/4″ sides, medium dice have 1/2″ sides and large dice 3/4″ sides. Paysanne are 1/2″ x 1/2″ x 1/8″ and can apparently be square, round, flat or triangular. The tourner is the most difficult cut. You are supposed to make a football shape, 2″ long with seven equal sides. It should be 3/4″ to 1″ thick. Try it and let me know how it goes. Rondelles is how you would cut your carrots for stew, just lots of rounds. Diagonals are rondelles cut at a diagonal. Obliques are cute and fun to cut. They end up being rather triangular. The cut is used on carrots and parsnips. You cut at a 45 degree angle, then at a 45 degree angle opposite the first. Like making a zig-zag down the carrot. Lozenges are flat diamonds. The only other things I have to study for Friday’s test are the point to cool food to in an ice bath before refrigerating it, (70 degrees), and types of menu. Typically, all the types of menu have French names, excepting the California menu. A California menu is a menu serving all meals around the clock. A la carte menus, you can order each food item separately and they are all priced separately. Semi a la carte, most things are priced and purchased separately, but some are combined. Table d’hote, your entire meal is planned out and served as a package. A banquet menu resembles a table d’hote style meal. This type of menu would be used at gatherings such as a wedding. None of the guests has a say in which food they want at each course. As for actual menu types, a static menu serves the same meals without change, a cycle menu works its way through sets of meals, sometimes taking as little as a week, sometimes a few months, sometimes longer. A market menu changes with the seasons and produce available. This type of menu can end up chaging every day. A hybrid menu is a combination of static and cycle or market menus. I only hope I can remember all of this test day. Now I have to go over them with my landlady for pratice. Also known as Culinary Foundations. CulArt102 is the start of my day, Monday through Friday and lasts three hours. This will last for eight weeks, until the class ends and CulArt111 begins. This class is a lecture class of sorts. For the first week, it was a true lecture class, with us sitting in the classroom (which doubles as the student-run deli from 11:00 to 1:00) for three hours, taking notes and reading aloud. This week, however, we have entered the realm of knife skills. Excepting today, in which most of our time was consumed by studying for tomorrows unit test, we spend the last hour in the kitchen, chopping vegetables. The first day, we batonned potatoes, diced onions, and minced garlic. In case you haven’t read your French lessons, the batonne is also the french fry cut, in dimensions 1/4″ x 1/4″ x 2″. Diced onions are supposed to be cubes with equal sides, but mincing is defined as a very fine chop of no particular dimensions. Wednesday we cut carrots in obliques and rondelles, as well as mincing shallots and making tournes out of potatoes. Next time we have knife skills practice, we are first going to go over spices, in preparation for the spice test at the end of class. In Foundations class, we have so far studied chapters 1,4,5,6,7, &amp; 9 of the 1400 page book that is our main textbook. Chapter One – Professionalism, also dealt with culinary history, which figures largely in the coming test. Pop quiz for my readers. What event of culinary note occurred 1475? I will be generous and give the answer at the bottom of the post. Chapters Two &amp; Three deal with nutrition and sanitation, both of which are entire classes in the program and therefore not included in Foundations class. Chapter Four deals with types of menu, recipe conversions, and types of service. Recipe conversions are very fun. First, you convert your ingredients to ounces. Then, you add all the ounces for total yield. To obtain a conversion factor, divide your desired yield by the current yield. Finally, to get your new recipe, multiply all the ingredients by your conversions factor. Yes, we do get to use calculators – even though I am capable of doing the math without one. Chapter Five is kitchen equipment. I now know what spider, salamander, and bird’s beak mean when used in the kitchen. A spider is a flat, fine mesh strainer, a salamander is a small overhead broiler, used to brown the top of certain foods and a bird’s beak is a special knife, about the size of a paring knife, used specifically for making tournes. Just to make things more confusing, in the Culinary Arts kitchen, stove tops are referred to as spider tops. Chapter Six is mostly vocabulary, with some technique, as it explains the most widespread cuts, their French names, and methods of creating them. These first chapters, along with Culinary History, are the material from which the test questions will be taken. Chapter Seven is titled flavors and flavorings. It catalogs all the herbs and spices common and sometimes uncommon to be found in the kitchen or bakery. It also lists wines, beers, and liquors and describes which foods or baking styles they best compliment. Condiments, spice mixes and oils are also discussed, while salt has its own page. Perhaps most interesting to read about is what different cultures over the years have labeled the tastes. The Chinese have a group of five tastes: sweet, sour, salty, bitter, and pungent. The Indians developed the same group, with the addition of astringent. These cultures attempt to create meals that balance all of these recognized flavors. Currently in America, there are five recognized flavors: sweet, salty, bitter, sour, and umami. Umami is a word plagiarized from the Japanese language and means something along the lines of ‘delicious’. Perhaps the best translation for umami would be ‘savory’. I am personally fond of Aristotle’s method of classifying tastes. He ranged his flavors along a scale, beginning with sweet, followed by succulent, pungent, harsh, astringent, and bitter. The scale ended with salty. The chapter also discusses the fact that while most foods have stronger flavors the warmer they are, salt can have a stronger taste in cold foods than in cool or warm foods. Finally, we come to the end of my newfound knowledge, at least that pertainig to Foundations. When I discuss baking lab, we will talk about chapters 30, 31, 32, &amp; 33. Homework for Foundations has so far consisted of the questions at the end of each chapter in the book, a synopsis of a movie in which a main theme was food and a current assignment, which is to get into a group of four or five and create a meal together. My group consists of Trevor the elder, Julie, Tyler, Morgan and myself. So far, our planned menu is Kaiser rolls, pasta with alfredo sauce and a zucchini dish. We also plan on a dessert and a meat dish. Today in class, we watched excerpts from Ratatouille and French Kiss, after we had the technician in to explain why there was no sound and fix the difficulty. Foundations class is the largest class I am in, as the labs divide us into smaller groups. Sanitation would be as large, but if the student has a food handlers license issued to them within the past few years, they can skip Sanitation. For everyone else, it is a pre or co-requisite for all the culinary arts classes. There are eight guys in the class, the other fourteen of us are girls. The only double name is Trevor, hence my needing to describe one as Trevor the elder and the other as Trevor the younger. Trevor the younger is my baking lab partner. And as I find my thoughts leaving Foundations class and drifting through interesting descriptions of baking lab, I shall leave off until another post, in which I shall deal with CulArt110 – Baking Lab. Bonus! As promised, the answer to our trivia/pop quiz. In 1475, a cookbook was published for the first time. The author was Bartholomew Platina, from Italy. The cookbook was called <span style=”text-decoration:underline;”>On Honest Pleasure and Good Health</span>.